Another look featuring the gorgeous RED Valentino! This dress catch my eyes as I went into the store. You can take off the belt for a looser fit but I wanted to have a smaller waist detail so this black belt has to be my pick. I think this is how I dress up if I am Mr Santa Claus’ Daughter. LOL. I am so happy that it goes perfectly with my Olympia Le Tan limited edition book clutch. 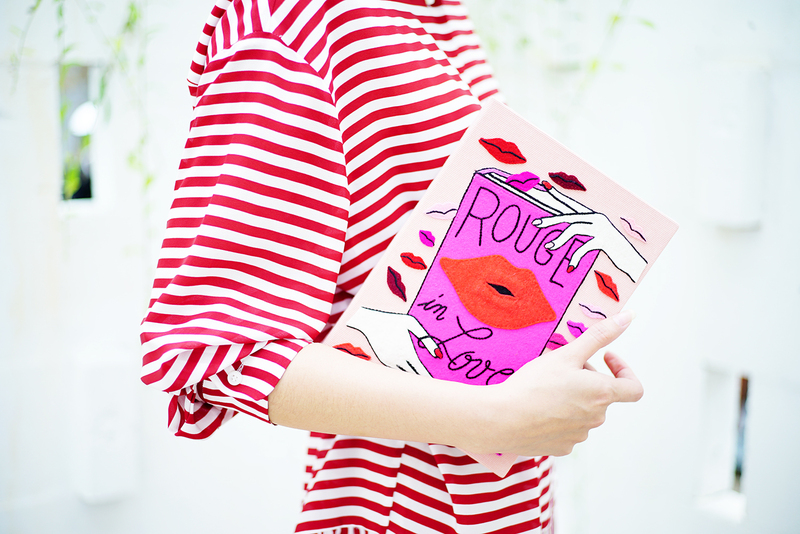 They collaborated with Lancome in the Rouge in Love lipstick & nail lacquer collections. It comes with 6 fabulous lipsticks and nail lacquer colors! They only produced 100 clutch worldwide and some of them are not for sale. They put numbers in every clutch and mine is the 35th out of the 100. Special thanks to Lancome as they generously gave this to me during Stella Rissa fashion show.